If you were to ask me what has been most memorable about my 2010 dining experiences, I would have to say tacos. Bloggers as restaurant critics can be a controversial topic. No matter what, a great restaurant review is well-written, thoughtful, and comprehensive. Your challenge is to write a restaurant review that encompasses those attributes and still comes from your unique perspective. I live in the Dallas/Fort Worth Metroplex, a bustling cluster of suburban cities anchored by two large cities that could not be more different. To the east is Dallas, the new money capital of North Texas, and the place where those who want to be seen go to party. If you want to see the latest trends, be they in clothes, cars or architecture, you should visit Dallas. Travel west and you will find Fort Worth, a town that loves its cowboy heritage. For the tourists there is the stock yards and cattle drives, but for locals Fort Worth has become a laid back place where you can work, live and play in understated style. So what, you may ask, has any of this to do with my restaurant review? Well, my two favorite places to get upscale style tacos are Taco Diner, founded in Dallas, and Yucatan Taco Stand, founded in Fort Worth. These taco joints offer a wholly different dining experience from the decor to the way the food is presented reflecting the spirit of the cities they come from. Let’s start with the Dallas* based Taco Diner. Taco Diner has a clean, modern look that would feel antiseptic were it not for the splashes of deep purple and some bright artistic touches. The hostess sat us and within seconds we had fresh, warm tortilla chips and two kinds of salsa. The green salsa, which was creamy and flavored with cilantro, was mild and not at all spicy. With a zippy vinegar base, the red salsa delivered some heat and a lot of flavor. My husband, who accompanied me, preferred the red while I had a lot of fun mixing the two. Service at this location was slow. 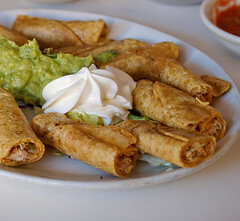 Once we had our drinks, and we had ordered an appetizer of Taquitos Del “Barrio”, billed as “Crisp-grilled rolled chicken tacos”, he disappeared for about ten minutes. He did eventually return to take our order, and to deliver our appetizer. 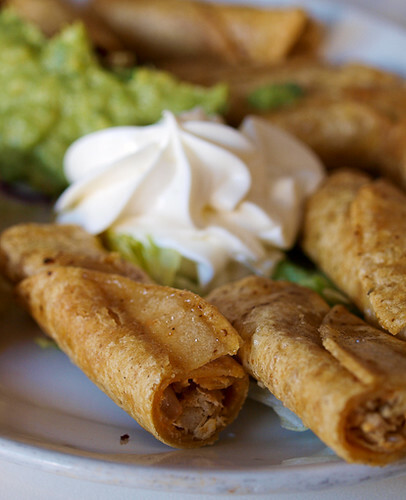 The description of “crisp-grilled rolled chicken tacos” is apparently code for ‘deep fried’, which these taquitos clearly were. They were very tasty, filled with seasoned chicken breast and served with fresh guacamole and thick Mexican crema. They were good, but not great, and they looked as if they were just dumped on the plate. For our main course we decided to ask our server what he recommended, letting him know we wanted to try as many tacos as we could. 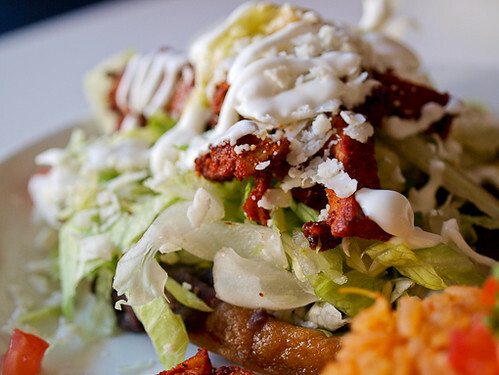 A taco plate consists of four tacos, in your choice of flour or corn tortillas, and is served with salad and rice. If you want some variety you can order two different flavors on a plate. For tacos he recommended the Bistec de Carne, grilled shredded beef seasoned simply with garlic and salt, and the Fish Tacos, comprised of citrus marinated tilapia that is pan seared. The tacos come with a plate of fresh chopped white onion, a wedge of lime, roasted peppers, and cilantro so you can dress them to your taste. He also recommended the Sopes Oaxaca with their seasoned pork. 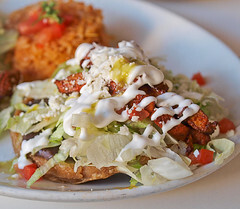 Sopes are thick masa cakes that are fried and topped, in this case, with black beans, lettuce, queso fresco, salsa verde and citrus marinated pork. The tacos were good, but not great. Tender and flavorful, the beef tacos were the best on the plate. Dressed with some fresh lime juice, onions and cilantro they were exactly what a street style taco should be. The same, sadly, can not be said for the fish tacos. They tasted slightly fishy and were somewhat mushy and no amount or lime of onion could salvage them. The sopes, on the other hand, were outstanding. The lightly crisp masa and the black beans make a delicious base for the marinated pork which is slightly charred, yet tangy and fresh. This is a dish worth coming back for. The rice, found as a side on both plates, was seasoned well but I did not like it as much as my husband did. Overall, this was a very good meal, and for the price, $34.46 for the flautas, four tacos, two sopes, and two drinks, it does not break the bank. Next, we went to the Fort Worth** based Yucatan Taco Stand. 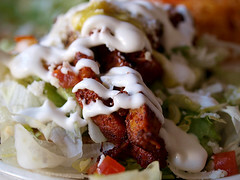 Yucatan Taco Stand is a very casual establishment as far as service, but the decor and feel is trendy and upscale. There are two options at Yucatan Taco Stand, dine in or take away. In either case you order your food at the counter, are given a number, and you are free to choose your own seat. 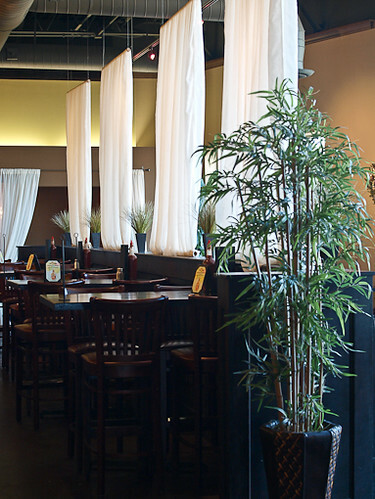 There are a combination of tables, banquets, and cozy recessed booths. The bar, which takes up one whole wall, is lit with festive gold lights. We placed our order, got our drinks, and took a seat. Within five minutes our appetizer had arrived. 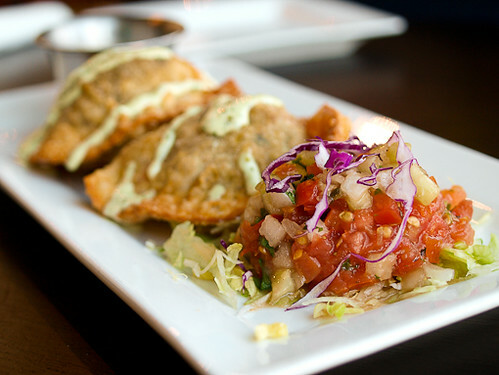 We chose the Empanadas Picadillo, beef and cheese stuffed pastries topped with garlic aioli and served with mango habenero sauce. Instantly the presentation struck me. The plate was thoughtfully composed, something our appetizer at Taco Diner lacked. 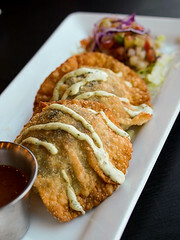 The empanadas were flaky on the outside and filled with perfectly seasoned beef on the inside. The only complaint I have is the mango habenero sauce was not spicy at all, and if you have habebero in the name I have an expectation of some heat. Timing may be an issue at Yucatan because we had only had our appetizer a few moments, long enough for me to take a few shots of it, when our main dishes arrived. Perhaps, in a place where you do not have an actual server but a series of runners, they can not track the diners as well? Anyway, our dinner consisted of two kinds of tacos, their signature Tempura Fish Taco, and a Garlic Shredded Beef Taco. The tacos are purchased individually here, so there are no accompaniments like rice or salad, but they are topped with a blend of lettuce, red cabbage, tomatoes, onions, cilantro, queso fresco, and garlic aioli. Each taco is served in its own basket. Since we ordered a non-taco item at Taco Diner we opted for the same at Yucatan so we went with Chilaquiles con Pollo y Chorizo. 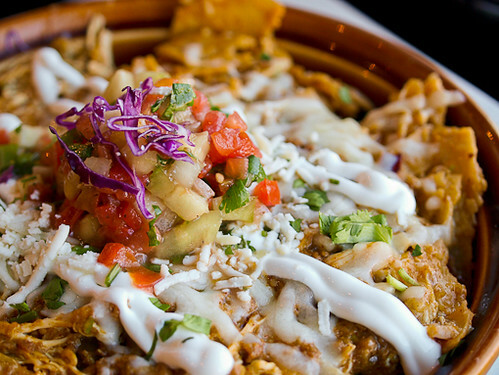 This is a dish of crisp tortilla strips cooked with shredded chicken, chorizo sausage, cheese, roasted peppers, onions, and topped with fresh salsa and crema. The tacos were out of this world. 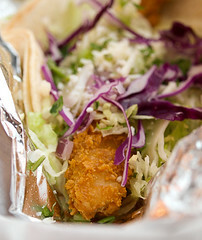 I have high expectations of signature dishes, and their fish taco did not disappoint. The fish itself was firm and flaky, with no hint of fish flavor. Something about crispy fish wrapped in a soft corn tortilla works for me, and with the garlic aioli I was sorry I had only ordered one. The beef tacos were juicy, tender, and with the crisp cabbage and lettuce surprisingly easy to eat. The only complaint I have with this taco is the beef was too finely shredded making it a bit messy to eat. 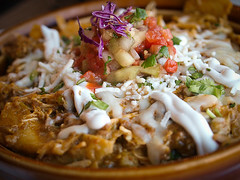 Providing the biggest surprise of the meal were the chilaquiles. They were the perfect balance of meaty, cheesy, spicy goodness. I do not usually go for cooked tortillas, disliking their mushiness, but these tortillas are cooked perfectly, still retaining some body, similar to al dente pasta. This meal of two tacos, a plate of chilaquiles that could easily feed two, empinadas, and two drinks came to $28.04. Well worth every penny since the food was so, so good. So, which did we like best? Overall, we preferred Yucatan Taco Stand. The service, if it can be called that, was not stellar, but the food more than makes up for it. From the thoughtful presentation of well composed food, to the atmosphere the Yucatan Taco Stand has it hands down over Taco Diner. That is not to say Taco Diner is bad. Far from it. If you like high gloss atmosphere and full-service dining then Taco Diner may be a better fit for you, and as long as you steer clear of those fish tacos. So, in the battle between Dallas and Fort Worth based taco stands, this round goes to Fort Worth. *For this review I went to the Plano,TX location of Taco Diner.